7.30π.μ- Oρθρος και Αρχιερατική Θεία Λειτουργία. The Monastery will also be open for visitors on Sunday. Please ring to confirm the programme. 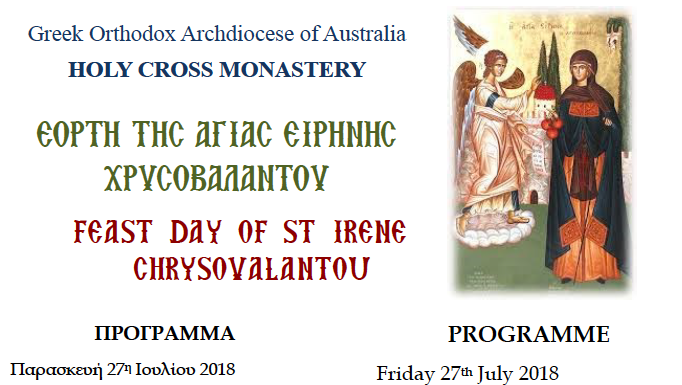 Visitors are welcome to come and venerate the icon of St Irene and receive a blessed apple. Tea and coffee and sweets will be provided courtesy of the Monastery. Please bring your own packed lunch. Large groups intending to attend any of the services are requested to notify the Monastery prior to the event. Unfortunately, the construction site will not be accessible to pilgrims on the Feast day due to safety reasons. For more information do not hesitate to contact the Monastery. See details below.